Overall there is one main reason to run this race - the course! It has an awesome variety to it. It's not super hilly but it's very technical and like nothing I've run before. The race did a great job overall with the race shirts, medals, organization. It was a short course but don't let that stop you from enjoying this incredible course. The area is awesome as well and it's a great vacation place to see the Tahquamenon Falls - something everyone should see at least once. Why not go and race while visiting? 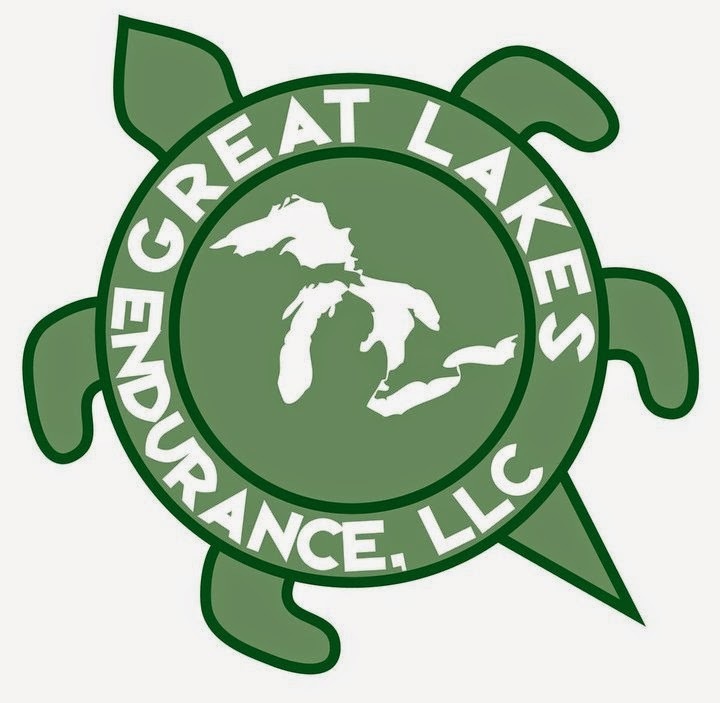 Registration for Great Lakes Endurance races are very easy. 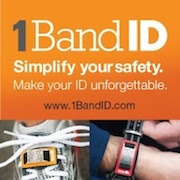 You can sign up via their website which will get you registered through Active(dot)com. I headed to packet pickup the day before the race which is your only option. Given the small size of the race, it would be nice to see packet pickup the morning of the race. I will say that these races are all in areas that you typically need to travel to (including the race director) so you would be up in the area the day of the race anyway. The race will allow other runners to pick up your packet too if you cannot get to pickup the day before. I made my way to the U.P of Michigan and it was a glorious day out. For those that have not been to the U.P. (that's Upper Peninsula for you non-Michigan runners), it's a real running treat and a great place to visit. 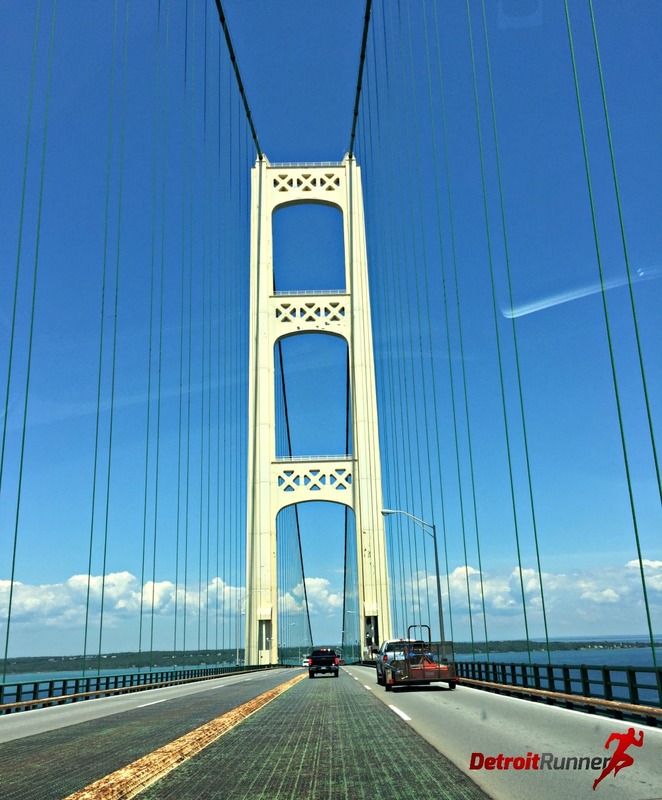 Everyone should experience going over the Mackinaw bridge. Packet pickup was located in Newberry which is about 28 miles from where the start of the race is. It's a little out of the way but if you take Route 2 from the lower peninsula, the views are scenic on the way there. It's worth going on Route 2 just to see the water. I got there almost when pickup started at 3pm and they went to 9pm so you had plenty of time to get there before they closed. The race was all set up in the school and I was literally in and out in a manner of minutes. It's the first time I've met the race director, Jeff Crumbaugh and his wife. I always say its a good sign when you see the race director both at packet pickup and race morning. Very nice people who know a thing or two about running trails. Haha! This was my second race running with Great Lakes Endurance. I ran Waugoshance last year and it got me hooked on them. Merrell shoes is their race sponsor this year. You had an opportunity to try out their shoes while you were there if you wanted. The race also had all the details for tomorrow too but it was basically the same information that was found on their website. It's nice to see the details there in case you didn't read it online. In addition, cell phone coverage was spotty in the area - in fact, I had no cell coverage in the State Park at all. It was kind of nice actually to get offline for a day. Note - I don't usually have a discussion about the race area, however, this is a fantastic vacation place and I wanted to highlight a few things. I stayed at the Lower Falls State Park campground. For $31, you could not beat it. After I got my tent set up, I went to see the falls since I had plenty of time. They are spectacular and I have not been there since 2011. This was actually my first time camping in a tent. 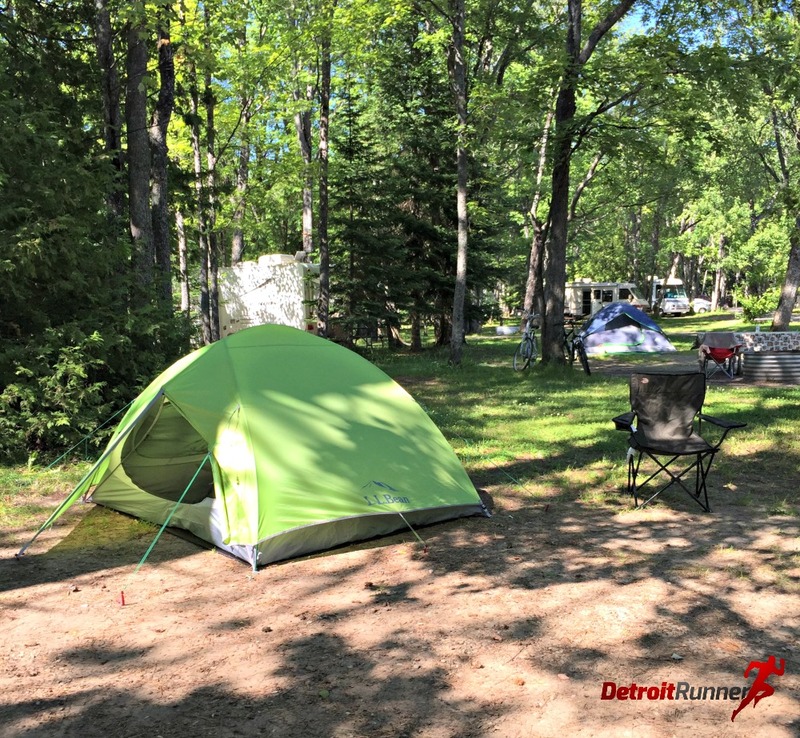 I've been camping before, but this year, since I was going to all of the Michigan races for Great Lakes Endurance, I decided to get a tent to camp and save on hotel costs. The campground was really nice and you could even hear the lower falls at night when you slept. After the lower falls, I went up to the Upper Falls. They have a brewery there so, of course, I had to partake in their craft beer - another one of my passions. Trail running has changed me a bit as I never would have drank beer the night before a race when I was road racing. I also got a chance to see the Upper Falls too. These are even more impressive than the Lower Falls. It's quite an area. I only ended up staying the night before the race, however, I wish I would have stayed an extra day and ran some more miles in the area. Oh well, maybe next time. Anyway, it's a fantastic area and worth taking the family up to see the falls. The next day the half marathon was not until 9am. It was nice that I didn't have to be up too early since I was only staying 4 miles from the start. The start was located at the Upper Falls. You don't run by the falls but it is very close and you could see them before or after the race if you wanted since it's just a short walk from the start area. The race was all set up and waiting for the runners to arrive. I got there about 8:15am and just waited in my car until closer to the start time. I would have never known there was a trail back there to run had I not come to this race. Just about 5 minutes before we started, the race director made a few announcements. We were to follow the blue flags and they would always be on our right. That held true as we were running the course. He also mentioned that this was the kind of race where you might have to throw out your shoes after the race. Haha! Not me. I was not about to throw out my shoes and I've been in muddy races before. I took a picture of one shoe after I cleaned it and the other dirty one. Good as new with a bucket of water and a scrub brush. See what a little elbow grease and a bucket of water can do? With that, we were ready to race! I love small races like this. You could have gotten there 10 minutes before the start and got going. It sure beats the huge races you have to get there hours before. Of course, if you were running the full or 50k, you needed to be there early to get the ride to the start since it was a point to point race for them. Note that most of the time I keep running my pace and just do the best I can with pictures. I did stop a couple places to take some pictures along the way because the views were just incredible and I wanted to make sure I had some great pictures. Mostly I just kept running so some appear blurry. I really didn't have anything planned for time on this. This was just being used as a training run in preparation for the Grand Island Marathon so I pretty much kept to training pace. I will say that the elevation, while not hilly at all, is very deceiving. It was not the elevation that spent your energy. It was the technical terrain and it was relentless the majority of the time. I loved it! 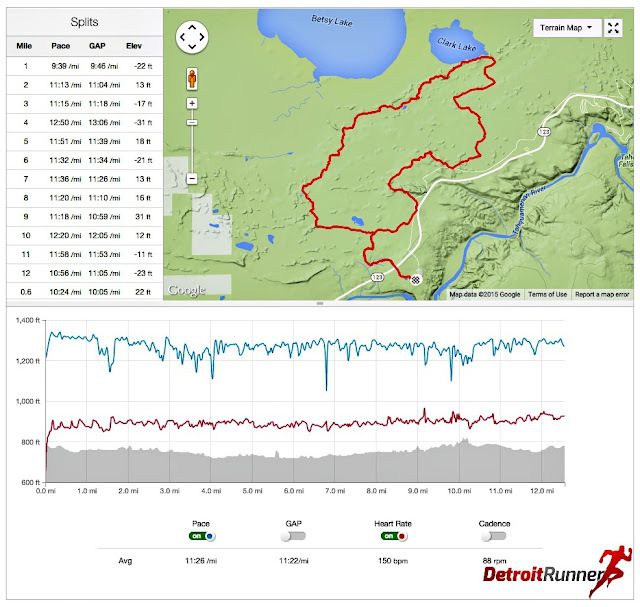 Map, elevation and splits - only 158 ft of elevation! Here's the results you get when you cross the finish line that the race prints out and gives to you. It's nice to get immediate results. As with most trail races, while smaller, they start a little crowded and then usually thin out in the first mile. This was no different. There was a wider area where if you wanted to pass others, it was easy at this point to do so. Even when we first started in the woods, it was two track so you could get by people if you wanted. I went out way too fast for the first mile and then dialed it back to training pace. The volunteers did a good job keeping us safe as we crossed a road. The trails were incredible and had a huge variety. They were called the Wilderness trail and you could certainly see why. There were a few times where it was hard to even see the trail. At first I just followed other runners while also watching for the blue flags. There were a few spots the markings really came in handy like as shown below. As we got in further, there were areas of ferns that literally made the trails disappear. I run a trail in the Jordan River Valley in Northern Michigan that feels similar to this. It sure makes for an interesting run as it's difficult to see where you are stepping. If you have not run through ferns before, it's quite an experience! Then we came upon the beaver dam that the race director told us about. Wow........wow! That's all I can say. The picture below is literally one step off the trail. I stopped to take a picture it was so amazing. The beaver dam was incredible! Of course, one of the things beaver dams do in this area is flood the trail. I sure was not expecting to have wet feet after less than two miles into the run. Oh well, after a few steps in mud and water going past your ankles, it really didn't matter where you stepped. There was no avoiding getting your feet wet in this part. I will say that my Hoka's did a good job draining so they didn't feel waterlogged the entire course. There was some beautiful climbs but not too difficult. The ferns were really pretty and I love running in the pines. It makes for such a soft ground cover. Even with the really technical course, it was very soothing to me. You really needed to watch for the flags as they were fairly spread out. I figured as long as I stayed on the trail, I would be good and that was true for most of the course. There were a few places where you would see the flag after the turn so you needed to watch for them. Below was so pretty. It was one of the best places on the trail with the pine needles, sun and hills all at once. As you can see below, there were things like the logs below which made this course more difficult. Usually when I look at an elevation it gives you an idea of how hard it would be. The map didn't do it justice - these were some tough footings and I loved every minute of it. You can see the hard footing just by the way the girl in front of me is running. The bushes next to the trail were grabbing at your legs as well which slowed you down somewhat. Finally we had some relief and were back to some flat ground where you could run and see the trail. Haha! Then I spoke too soon and you would be back to running on logs along the way. Believe me when I say that my pictures only show a small portion of what we ran through. This was really fun! We came upon a swampy area that was really nice. The trail was also somewhat wet but nothing like the beaver dam area we ran. Of course, anytime you see bridges, you knew that there was probably some wet trails in the area. This area near Clark lake was really beautiful and a little easier trails too. The trails near the lake were just my kind of trails. Not super technical here but nice and soft with pine needles - my favorite surface to run on. Not too many hills to climb on this race. In fact, the one below was one of the steepest and even that was not too bad. Then we were back to the technical areas with the heavy cover of the trail. Before I knew it, I was already at mile seven! In this area, there were not many runners around me at this point so I was just watching for the trail and the blue flags. Holy ferns! I could barely see the trails! Hah! I'm ON the trail - seriously! This grassy area was interesting. I can't believe it was even part of the trail. The grass was high and it was wet. It didn't even feel like part of the trails. As I mentioned, the variety of the course was great! Mile nine and we were back to the ferns. This part of the course was interesting. First we had the openness of the picture above and all of a sudden, the forest wrapped around you on the trail. It was a really cool feeling. I took a picture of a couple tree stumps because I could not believe how large they were! This area was really scenic too as there was a large drop off to the right of us so you needed to watch your footing as you made your way down the trails. We were also getting back to the muddy area of the race where it was wet in parts on the trail. I took the picture below because I never would have known it was the trail had I not seen the blue flags. I didn't really seen any trail markings on the trees in this area and just hoped I was going the right way. I was, of course, and there was no issues. The tree stump we passed below must have been at least 12-14 feet high. It was gigantic! Back for a little more mud as we were almost done with the race. Back to some two track as we made our way through to mile 12. Markings for the marathon/50k started showing up too and even a 50k runner past me near the end. In fact, I think she was the winner. She looked so refreshed too after all those miles. I congratulated her and she took off running past me. Another pass of the ponds and I knew we were close to the finish. With that, we finished the race. I will say that the course was short. It was showing about 0.5 mile short from my Garmin. Normally I would not trust the Garmin in the woods, however, the race director told us at the start that the course was running short. I would have liked to see a way for the race to push out that extra half mile to get us the full half marathon distance. It might have been difficult given the terrain. Perhaps even running around the pond at the start and the finish would have gotten us there without much extra work on the races part? There was only one aid station on the course for the half marathon. All runners were required to carry their own water bottle which I do anyway. It's one of the races environmentally friendly items and I applaud them for doing this. There is nothing worse than seeing empty cups on the trails. I stopped and had a gel and filled up my water bottle while talking to the volunteers. The mosquitos seemed pretty bad in this area. I'm glad I only stopped for a minute to get my gel down because they might have carried me away! Haha! Even a couple volunteers had on mesh screens to keep them off. The volunteers were friendly and helpful. The finish area was the same as the start area for the half marathon. If you ran the full marathon or the 50k, you were bussed out to the starting line. The area was well organized and they had given you a print out of your time right when you finished. After, you could get some food and drinks. I'm not a huge HEED fan but I do love Hammer gels. They are the only ones that don't make me sick. The race had cherry juice and Great Lakes Endurance is the only race I know that offers it. I love it and it seems to help with your recovery. They also had bananas, sourdough pretzels and fig newtons. A little different variety from what most races offer. 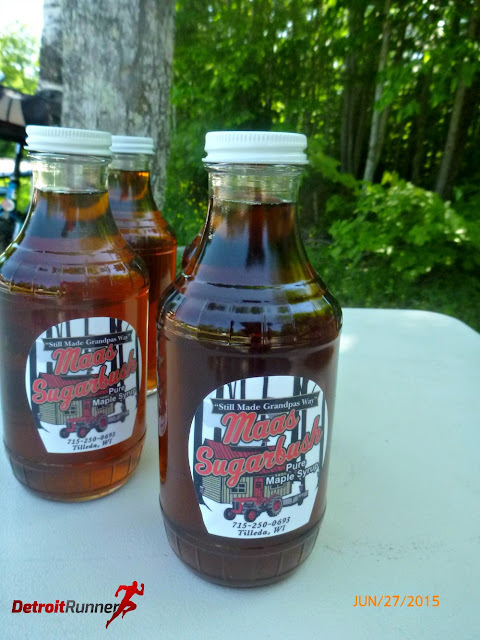 The race was also giving out maple syrup if you were an age group winner but unfortunately I was not fast enough. For your entry, you received a marked course with a timed race bib. The race bibs were recycled at the end of the race so I just took a picture because I gave it back. You also received a car decal with the race company's logo. Their logo is really cool too. I already put mine on my car. 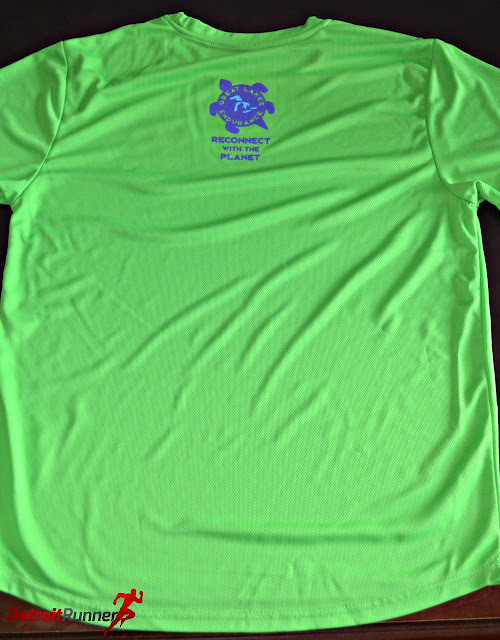 Everyone received a technical race shirt. I like the bright green color. I also like that the logo on the shirt is not the entire front of the shirt. It's really nice that it's just the pocket area of the shirt and what a great design too! I also love the fact that there is no sponsors on the back of the shirt. Just the running company logo and that is it! Fantastic! I don't feel like a walking billboard. This shirt will get used a lot in training and for other races! 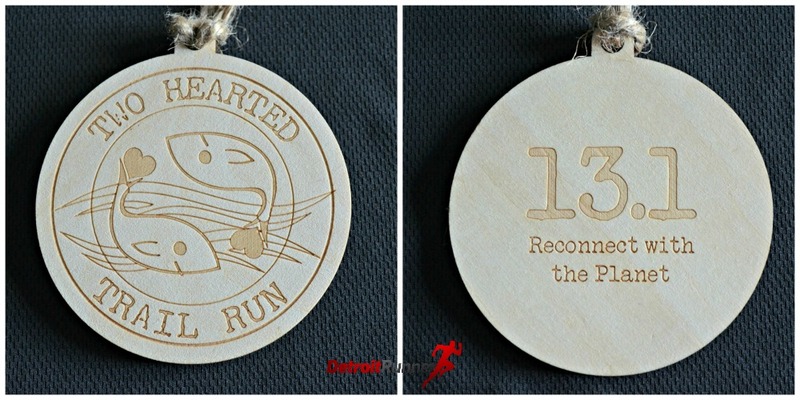 All finishers received a wooden race medal with the race name on the front as well as the distance you ran on the back. It was a really unique race medal and again the awesome design of the race logo. The organization was good overall. The race kept you informed of any changes via their Facebook page. You received an email with good instructions. Packet pickup was easy to find and was well organized. The start/finish area was well planned and everyone knew where to go. The course was short, which is disappointing, and I'd like to see them adjust it somehow to get at least to 13.1. I will say that had the race director not told us it was short, I would have just assumed that my Garmin was off being in the woods. Overall, regardless of the short distance, I would come back just for one reason alone - the fantastic course! It was an absolutely incredible trail like no other I've run and with so much variety that this race is worth running. There were several parts of the course where my jaw just dropped from the beauty. I loved that the course was technically tough but don't let that scare you. This is a very runnable course and a great one to try and the half distance does not kill you. Ha. The full or 50k - wow, I'm in awe of those runners running this course. We had nice weather, even if a bit too warm, but that can be expected in late June, even in the U.P. The area of Tahquamenon Falls is gorgeous and worth the trip. If you are from Michigan and have never been here, the race is a great excuse to come up and enjoy the area. For those out of State (and even those in Michigan), I suggest staying a week and traveling to several places in the Upper Peninsula. It's a perfect family vacation. It's like no area in Michigan. If you like trails, you will love the half course. I sure did. After the race, I ended up packing up and driving back to my cottage to partake in a few adult beverages. 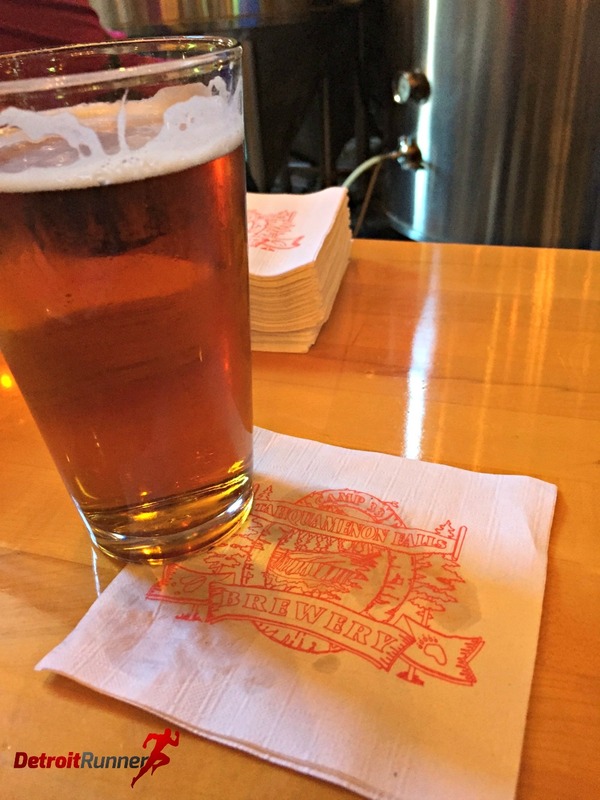 What better way to end the Two Hearted trail run than with a Bell's Two Hearted Ale. 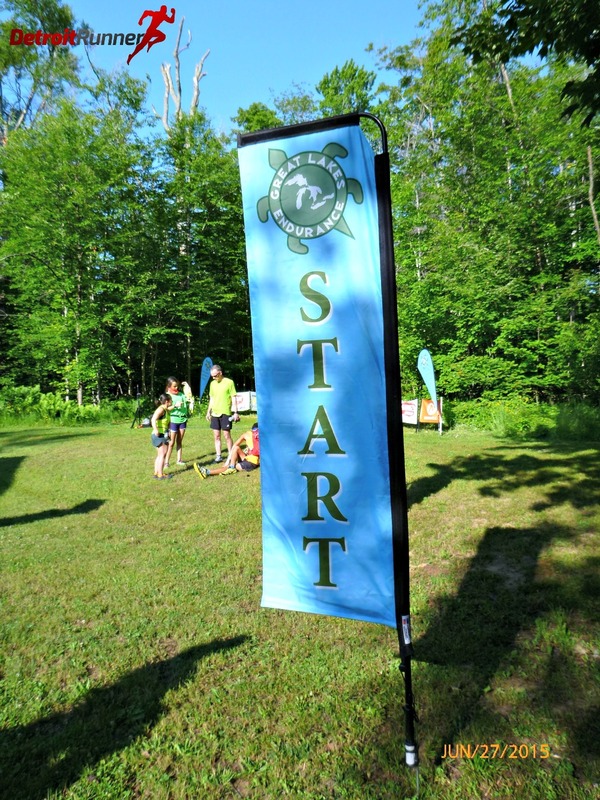 Next up for me is the Waugoshance half also put on by Great Lakes Endurance. There is still time to join me for this awesome event. See you July 11th in the Mackinac area. Disclosure: I received a discounted race entry in exchange for a race review. All opinions are my own and I was not required to say anything other than an honest opinion. Looks like a lot of fun and the type of race I would line up for... one day when I'm rich! I'm definitely going to consider this one for next year! So glad I ran across your race review. 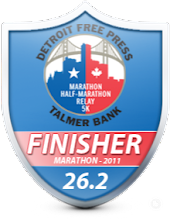 I just booked our reservation at the TF campground and plan to sign up for the half marathon in the coming days. Loved getting so much detail about the race, which will be very different than anything else I've ever done! I'm definitely doing this one next year!!! One month until Grand Island Marathon!!!! Waugoshance trail race in one month!